Totally amazing taco pizza recipe! So easy and so delish! 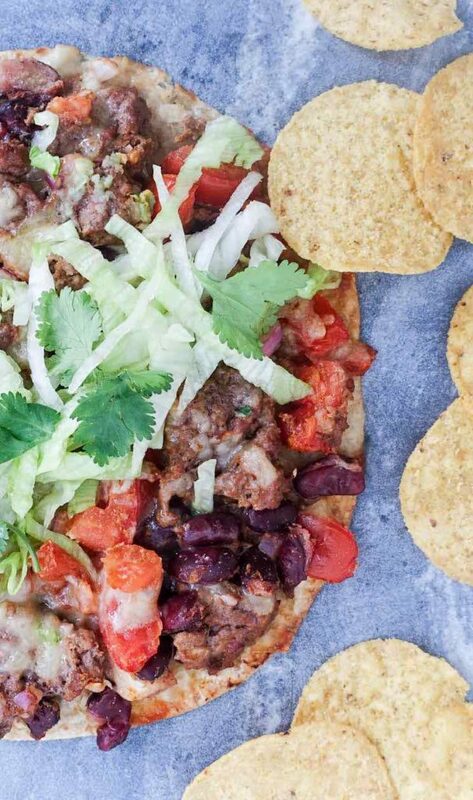 Totally amazing taco pizza recipe. 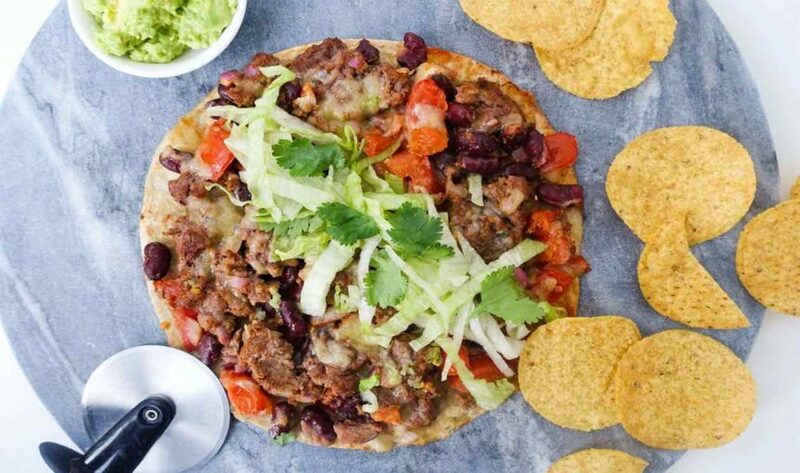 This epic, totally amazing taco pizza recipe comes from another amazing Merrymaker contributor! YAY! This time it’s from Rani who creates magic over at You Totally Got This! Over to you Rani! E + C.
It’s a taco…it’s a pizza…no it’s taco pizza. And it’s landing on a plate near you! When the Merrymaker Sisters asked me to share a recipe with you, I just knew it had to be this one. Why? Because it’s absolutely freaking delicious. I mean when you cross a taco and a pizza it has to be amazing right? But add a side of corn chips, and you’ve got something insanely delicious. Cos, corn chips…corn chips make EVERYTHING better! And wait for it…this pizza is actually good for you. Yes, seriously! Each taco pizza has a whopping three serves of veggies. That’s half the veggies you need each day in one delicious meal. So it’s official…you can get your healthy on AND and eat pizza. In fact, this may just be the most delicious way to get your healthy food fix…EVER! But the best bit? You can land this yummy meal on the table tonight. The recipe is super quick and simple. For real! All you need is 30 minutes. And because everything goes in the oven, there’s no mess or fuss to deal with after dinner. Thank goodness for that, coz cleaning the kitchen…ain’t nobody got time for that! This is one quick, simple and delicious weeknight meal you’re not going to want to miss. It didn’t get the name totally AMAZING taco pizza, for nothing! Place the beef mince, onion, kidney beans, tomato, garlic, cumin and paprika in a large bowl and mix until well combined. Season with salt and pepper. Place pizza bases on lined baking tray, and spread them evenly with the meat mixture. Sprinkle cheese over the top of each pizza, and pop them in the oven for 10 minutes, or until the mince has cooked and the cheese is all yummy and melty. Meanwhile shred the lettuce, mash the avocado, and pick the coriander leaves and set aside. Once the pizza is cooked, remove from the oven and top with lettuce, coriander and avocado. Serve with a handful of corn chips for an extra yum treat. Lactose intolerant? You don’t need to miss out. Replace the tasty cheese with your favourite nut cheese or try making the Merrymaker Sisters paleo cheese. Its super delish!